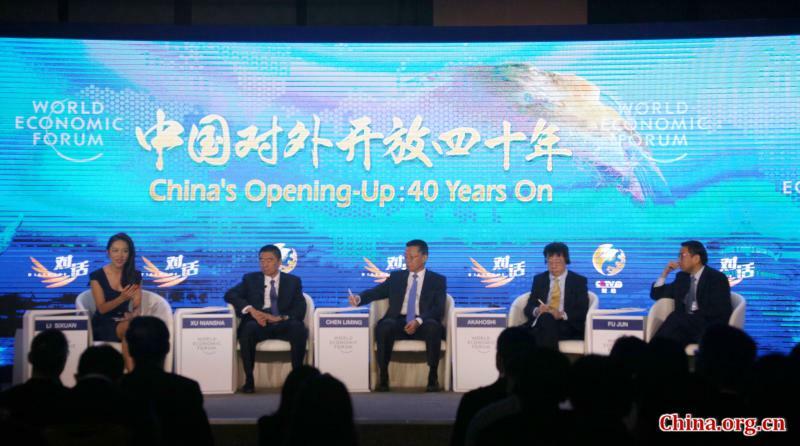 Business leaders at a panel discussion themed on "China's Opening-Up: 40 Years On" during the Summer Davos in Tianjin, 2018, on Sept 18 said that foreign enterprises have begun to change their business strategies in China. From "made in China" to "made with China", foreign and Chinese enterprises are actively embracing new technologies to drive future growth. "Thanks to China's 40 years of reform and opening up, many opportunities have been created for the Chinese people and the world. This is why we are here to talk, and seek a win-win cooperation," managing director of the World Economic Forum David Aikman said. Chen Liming, chairman of IBM Greater China Group, said at the beginning of China’s reform and opening up, China had a huge potential market and abundant labor, which attracted many foreign enterprises to China. Nowadays, they are bringing technology to China and cooperate with China to further develop markets and technology. "The development of Chinese enterprises is very rapid, and there are a large number of enterprises that have become competitive in the international market, which plays a very important role in the transformation of foreign companies' roles," Chen said. For many Japanese companies, "co-creation with China" has become a hot topic in the commercial field. Yasushi Akahoshi, president of the Japan External Trade Organization (JETRO) said China's innovative companies and start-ups are very strong, "I often visit Beijing, Shanghai and other places in China and visit numerous R&D Centers. If you return to these places after three months, you will find great changes there." He said that Japan and China have many opportunities in co-creation, such as an aging economy, inclusive finance, education, and mobile payment. "China's technological innovation capacity has become an important reason in attracting Japanese companies. The fourth industrial revolution has brought many opportunities for both Japan and China," Yasushi added. From "made in China" to "made with China", foreign enterprises and Chinese companies are actively embracing new technologies to drive future growth.